“Every tether is always 100% backed by our reserves, which include traditional currency and cash equivalents and, from time to time, may include other assets and receivables from loans made by Tether to third parties, which may include affiliated entities (collectively, “reserves”). Every tether is also 1-to-1 pegged to the dollar, so 1 USD₮ is always valued by Tether at 1 USD,” Tether says on its homepage today. While we don’t exactly know what “other assets” might refer to, but it makes us guess that Tether may hold part of its USD reserves in cryptocurrencies. 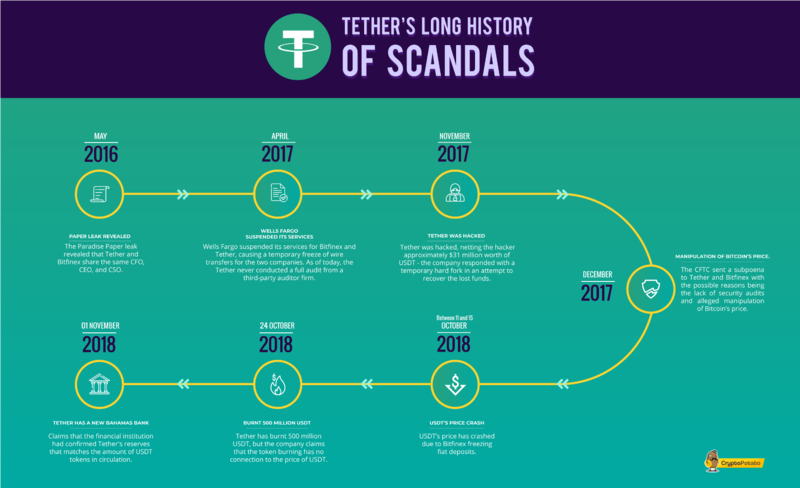 This was not the first case when Tether’s USDT reserves were in question because of their dubious nature. In June 2018, the law firm Freeh Sporkin & Sullivan, LLP (FSS) published a report claiming that all USDT in circulation was fully backed by USD. The CFO and General Counsel of Tether even certified this by a sworn statement. However, the report contained multiple caveats as it was not a real security audit over the company’s reserves. Furthermore, Tether’s new statement on its website is contradicting the findings of the FSS report. The FSS was not the first company who tried to verify Tether’s reserves. The firm Friedman LLP was hired by Tether to conduct a security audit on its USD reserves. In September 2017, Friedman published a preliminary report where – according to the company’s findings – all USDT in circulation was fully backed by fiat. As the report did not come from a full audit, the information in it was skin deep, containing multiple caveats (like FSS’). Moreover, Friedman never had the chance to conduct a full security audit on Tether’s reserves as the relationship between the two firms ended in January 2018. In November 2018, Tether announced that it had opened a bank account at The Bahamas-based Deltec Bank & Trust Limited. Along with the announcement, the stablecoin issuer stated that their new bank did a thorough review on their activities as part of a background check that had verified that approximately $1.8 billion was held at the company’s bank account. At the time, CryptoPotato checked Tether’s transparency page and found that the reserves on the bank account match the amount of USDT in circulation. However, Tether’s new statement contradicts with Delta’s findings too.